A few months back, when my husband and I decided to head over to Culver City to check out The Coolhaus Shop and find out what the big deal was about their ice cream and ice cream sandwiches, we happened to stumble onto a very well known Los Angeles bar which many regard as serving the best hamburgers in Los Angeles. My husband and I had both heard of this bar/gastropub before through the grapevine and from co-workers, but we’d never discussed going with each other, or even seeking this place out. But once, we knew it was there, it was on our minds that we would have to go back and check it out. After all, we needed to try out the so-called best hamburger in Los Angeles. Father’s Office is the brain child of check Sang Yoon who had an idea to open a casual restaurant serving great craft beer and bar snacks. His inspiration was the Spanish tapas bars of Spain where you can walk in, order a couple of small plates while you drink wine or beer and just relax and enjoy yourself at the neighborhood joint. So how did a bar serving bar snacks come to be known for a very controversial burger? 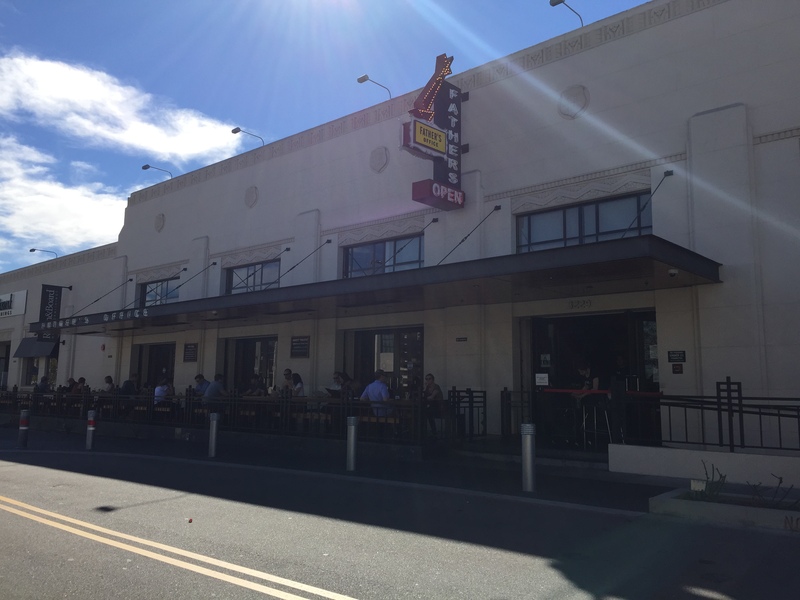 When the original Father’s Office opened in Santa Monica in 2000, the concept of serving food people would actually want to eat at their neighborhood watering hole was a bit of a foreign concept as most people went to a bar to drink, not for the food. But, as a chef, Yoon, wanted to change that, so who had a small kitchen built into the back of the bar and he set about coming up with a menu for his new bar. That’s how the Father’s Office burger was born. What people know now of the famous Father’s Office burger, or perhaps why it’s so notorious is the for the following quote written on the bottom of each and every menu, “no substitutions, modifications, alterations or deletions. Yes, really.” Because the original kitchen was small, the idea of customizing anything on the menu was pretty much impossible, so Yoon enforced the concept that everything on the menu came exactly as is, and if you didn’t like it, you either dealt with it or didn’t order it. Today, that same philosophy still applies, and if you try to order any dish at Father’s Office a certain way, you’ll be turned down unceremoniously. At Father’s Office’s Culver City location at the historic Helms Building, you step into a beautiful indoor/outdoor bar. 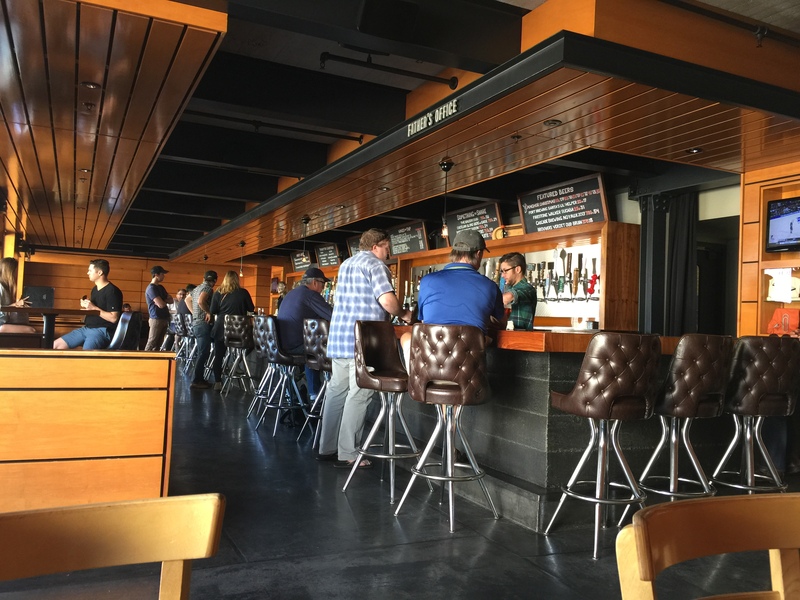 With many craft beers, including many international beers that are hard to find at other establishments, on tap, you can take a seat at one of the numerous bar stools surrounding the wood top bar, or you can grab a seat at one of the many tables and booths inside or the tables or with bench seats on the outdoor patio. Seating is first-come, first-serve, and there is no table service at Father’s Office. If you’re there to eat, you’re provided with a menu when you walk into the bar (for which you must be over 21 or over to enter), and when you’re ready, you step up to the bar and place your order. You pay for your food up front, unless you want to start a tab. When your food is ready, it’ll be brought out to your table. 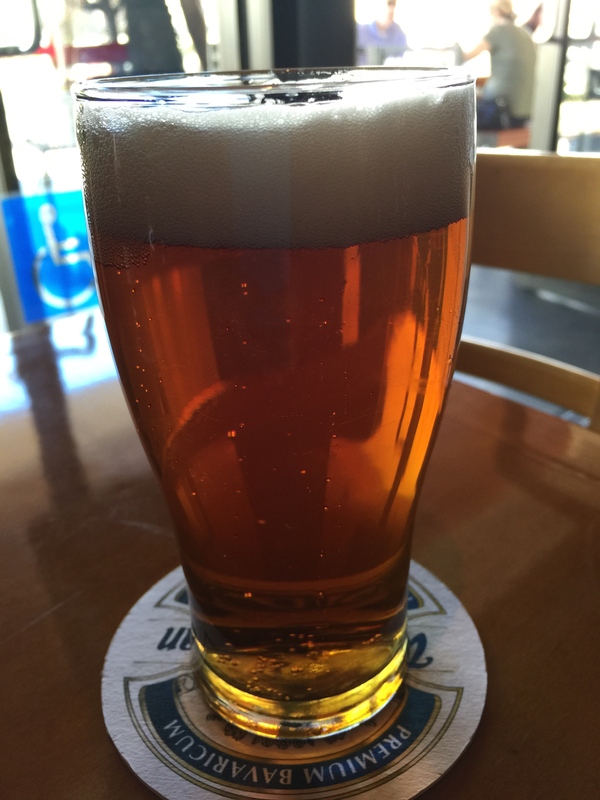 Having just returned from San Francisco not too many weeks earlier, my husband decided to order a pint of Anchor Steam, his favorite San Francisco brew to go along with his famous Office burger. Anchor Steam on tap, even better than the bottled version he had when we were in San Francisco. I opted for a nice bottle of Coke. 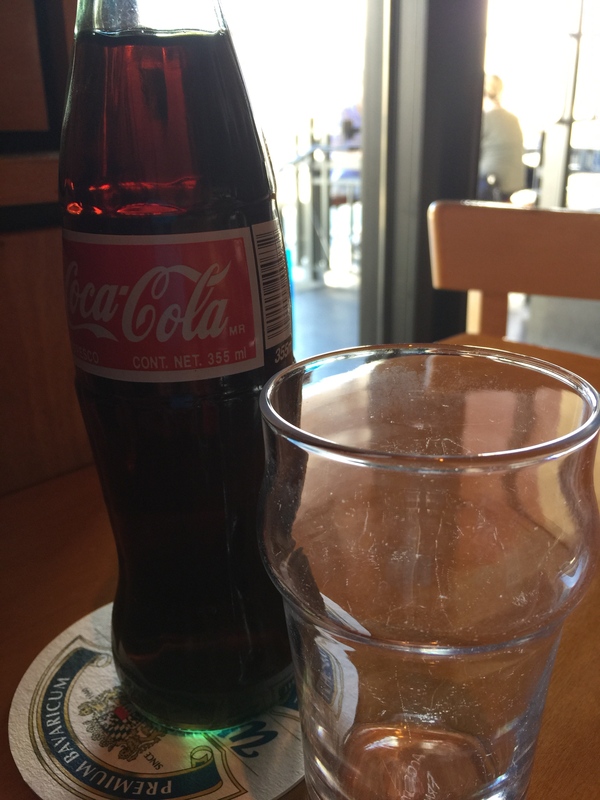 Of course it wasn’t a fountain soda in a cup, but an actual glass bottle of Coke and a cup to pour it into. You can’t beat an ice-cold, glass bottle of coke on a nice weekend day. Ok, for our first trip to Father’s Office, we just couldn’t order anything but the Office burger. While there were other appealing items on the menu, the Office burger was why we decided to come out to Father’s Office. Yoon says that his inspiration for creating the Office burger was the French onion soup. Not the soup specifically, but the beef broth that creates the soup. He was looking to create something that would highlight that strong beef flavor, and from that idea came this gourmet burger. Strong beef flavor, caramelized onions, Gruyere cheese, all the things you think about in French onion soup is found in this Office burger. 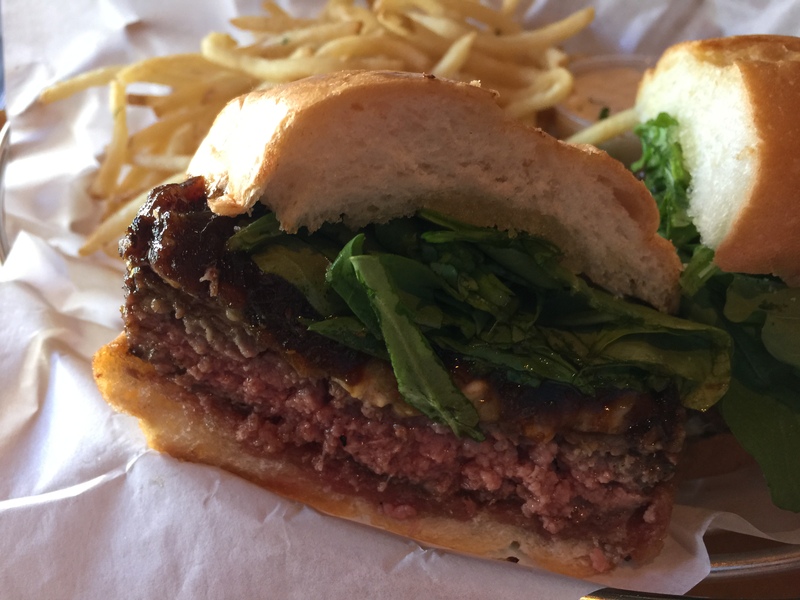 The menu describes the burger was created from caramelized onions, bacon, Gruyere, maytag blue cheese and arugula. The burger is made from an oval shaped crusty hoagie-style bread roll. It’s crunchy and grilled with a bit of garlic butter to give it some added crunch. The bread is meant to absorb the flavors of the burger. The meat in the burger is created from dry aged beef as a way to highlight and enhance the beef flavor of the burger. It was Yoon’s way of elevating the beef from just a regular burger. The addition of the peppery arugula and the blend of maytag blue cheese with the Gruyere, Yoon says is to again enhance the flavor of the beef as they are complimentary beef flavors. The rest of the burger is made with caramelized onions and Gruyere, both items highly prevalent in French onion soup. The result? A wonderfully fantastic burger. My husband says he’s no burger connoisseur, but this is probably the best burger he’s ever tasted. When you bite in to the burger, you definitely taste the beef, and as Yoon had hoped, the beef is the star of the burger. The strong, rich beef flavor is highlighted in every bite and the burger is cooked perfectly. It’s super juicy and moist, exactly what you’re looking for in a burger. The blend of the Guryere cheese and the maytag blue cheese is fantastic. The blue cheese doesn’t overwhelm and overpower the burger as it’s used sparingly, so every now and then you get hints, almost pockets, of delicious blue cheese. It’s like a small burst of pungent blue cheese flavor that blends so seamlessly into the nuttiness of the Gruyere cheese. It’s an amazing cheese blend. The pepper bite of the arugula does compliment the burger well, and the caramelized onions create this very silky, smooth texture and add a bit of saltiness to the burger. This really may be the best burger in LA, just as advertised. It would be hard to find a more unique, tastier burger. Along with the burger, we also order the frites served with garlic parsley aioli. Shoestring frites, just the way my husband likes his fries with only garlic parsley aioli as dipping sauce. Remember the slogan, “no substitutions, modifications, alterations or deletions”? Yeah, that applies here too. Don’t even bother to ask for ketchup with your frites, there is no ketchup to be found here at Father’s Office. You can either use the garlic parsley aioli, or just eat the frites straight up. No other option is available. Honestly though, no other option is necessary. The frites are perfectly fried with the outside being crispy and the inside being hot and tender and starchy. 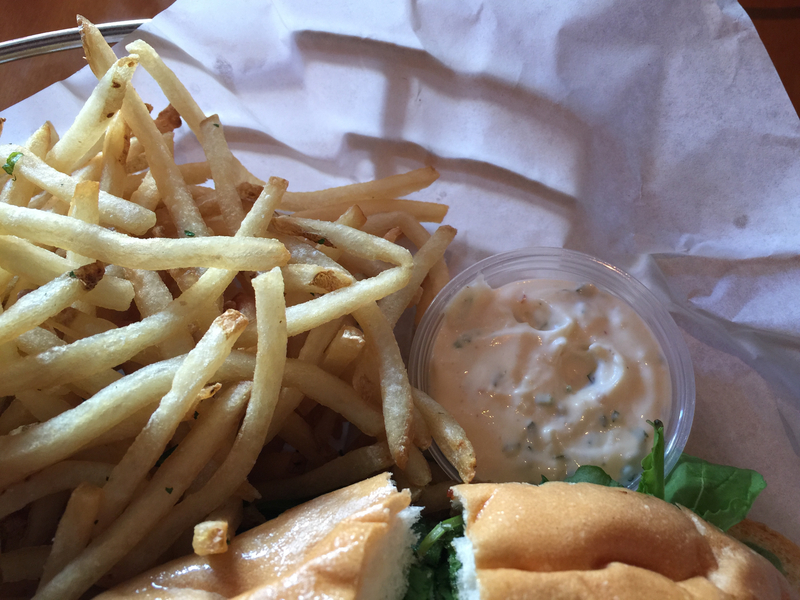 The garlic parsley aioli is a perfect dipping sauce for the frites, and they go so well with the flavors found in the Office burger as well. Ketchup really just wouldn’t work here. My husband who doesn’t even use ketchup with his fries normally, and generally isn’t a fan of sauces, actually found that he liked the garlic parsley aioli. To my surprise by the time he finished his fries, half of his aioli dipping sauce was gone. The subtle garlic flavor of the aioli works well with the skinny fries and the French onion soup, with the addition of the blue cheese, inspired flavors of the burger. They all just go so well together. When you start eating the burger and the fries, you just don’t think about the ketchup, or lack thereof, at all. 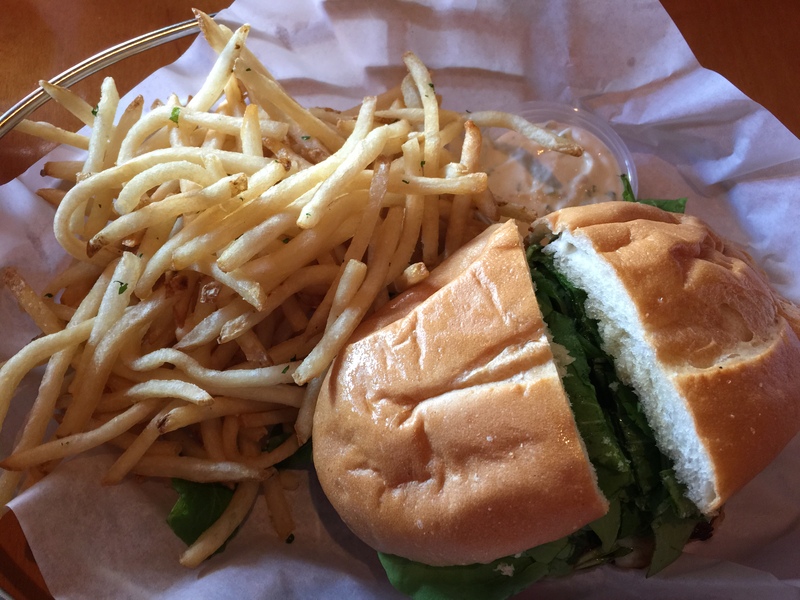 Even weeks after my husband and I had the Office burger and fries at Father’s Office, we couldn’t stop talking about, and thinking about, and generally raving over the food. I think that’s probably the truest test of whether or not an eatery has good food, that you dine on something that you just can’t forget, that every aspect of what you had is something you can recall instantly, whether it’s the tangy and nutty flavor of the blend of Gruyere and blue cheese, or the sweet onion jam, or just how juicy and flavorful and perfectly cooked the hamburger patty was, or just how crispy on the outside and tender on the inside the frites were. For my husband and I, this combination of burger and fries, was the most perfect burger and fries we’ve ever enjoyed. We just kept asking each other, when would it be appropriate to go back there and eat again?